On the 1st of September 1939 at 0445h 1. Infanterie-Division crossed the border into Poland. The intelligence reports concerning the strength of Polish forces soon proved to be wrong. The only noticeable resistance was met at the bridges at Janowo (two platoons of Infantry), which was easily brushed aside. As I. AK had failed to break through the Polish defences at Mlawa on the 2nd of the September, the Division got the order to push forward on both sides of the road to Grudusk and then, using all available artillery as support, to take the strong fortified positions on and around Gora Kamienska on the north-eastern flank of Mlawa. As this action is considered to be a part of the “Battle of Mlawa”, let’s have a look at that first. 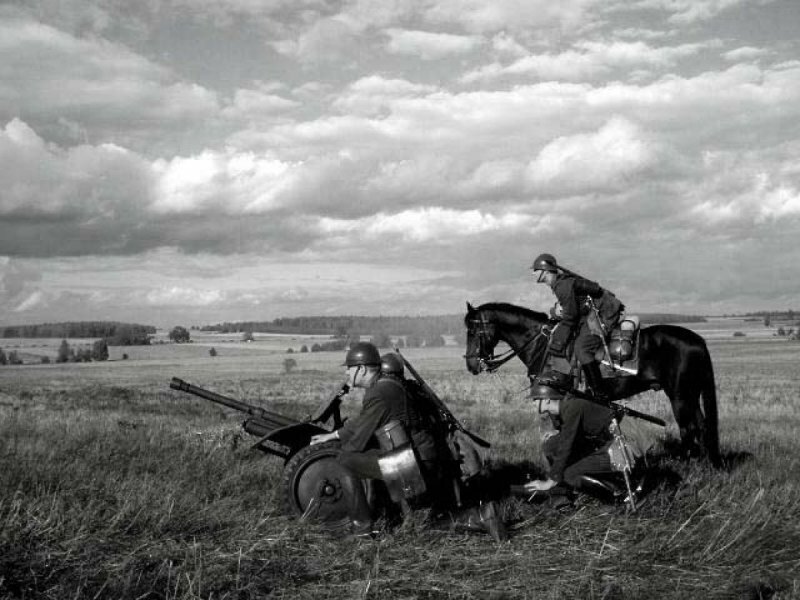 The Battle of Mława, otherwise known as the “Defence of the Mława position”, took place to the north of the town of Mława in northern Poland between September 1 and September 3, 1939. The whole battlefield, with the exception of the fortified positions around Gora-Kamiensk was (and still is) flat as a table. It was one of the opening battles of the Invasion of Poland and World War II in general and fought between the forces of the Polish Modlin Army under Gen. Krukowicz-Przedrzymirski and the German 3rd Army under Gen. Georg von Küchler. As a result of the Treaty of Versailles, the new German-Polish border was located only some 120 km north of Warsaw, the Polish capital city. 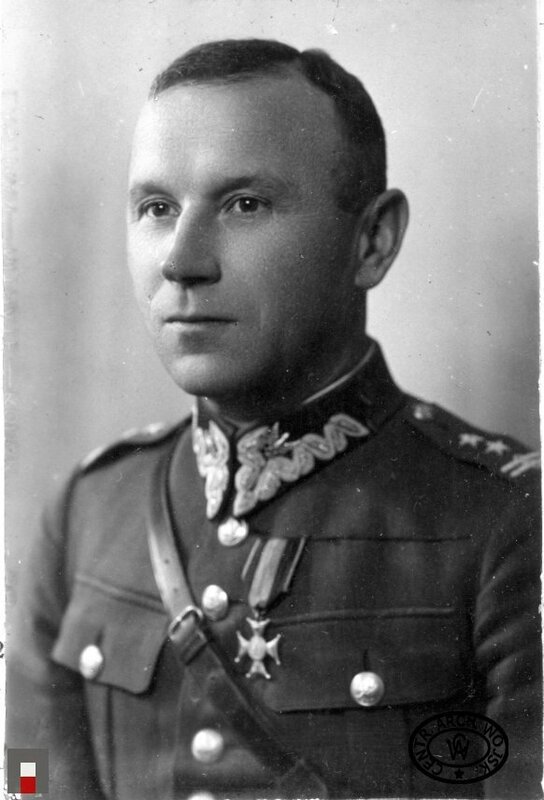 In 1939 the Polish Modlin Army, led by Brigadier General Emil Krukowicz-Przedrzymirski, was thought of as the main defensive force guarding Polish borders from the north. It was dislocated along the border with East Prussia and was to stop the enemy forces advancing towards Warsaw, the Modlin Fortress. Shortly before the war, a decision was made to strengthen the Polish defences by construction of a line of field fortifications and concrete bunkers to the north of Mława, in the centre of the army’s positions. The main line of defence of the army was located along the line of Narew and Vistula rivers. 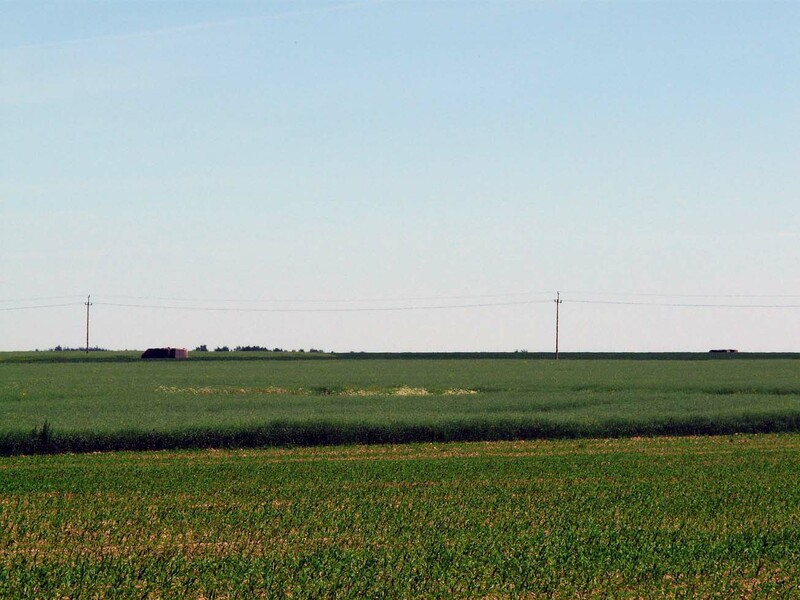 There were a number of 19th century fortifications in the area, but the plains to the north of it were almost defenseless. To ease the delaying actions in case of a war with Germany, the Polish General Staff decided that the Modlin Army should be transported to the border with East Prussia and should defend the line for as long as possible. Afterwards, the units under command of General Przedrzymirski-Krukowicz were to withdraw to the south and defend the line of Narew and Vistula rivers, together with the forces of Narew Independent Operational Group. After the Polish secret mobilization had started in March 1939, the 20th Infantry Division was assigned to the Modlin Army and transported to the area of Mława. In addition, the army commander was assigned a number of trainloads of concrete and other construction materials and several combat engineering battalions. 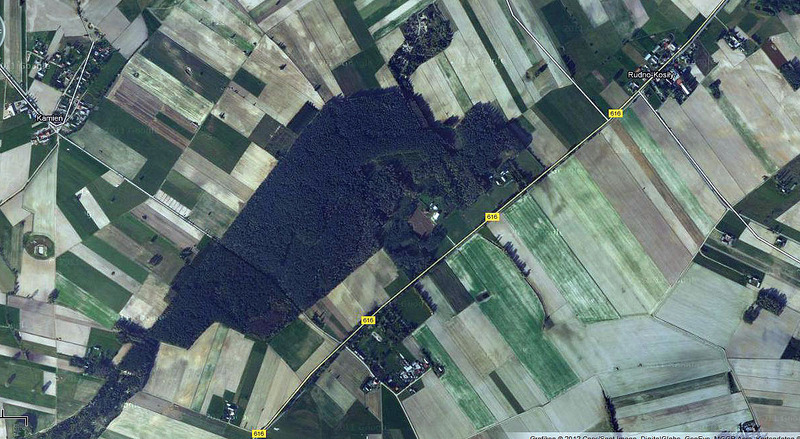 It was decided that a line of fortifications should be constructed in the area held by that division. On June 19 of that year, the project was ready and was finally approved by Marshal of Poland Edward Rydz-Śmigły on July 3. Iron railway tracks used as an effective defence against german armour. The line of trenches and concrete bunkers, shielded by anti-tank trenches and obstacles, was to be constructed along a low glacial hill overlooking the valley of the Mławka river, to the north of the town. The river itself could be blocked by a dam to enhance the defensive valor of the area. In the center, a swampy terrain of the Niemyje Marshes was located, which was virtually impassable to enemy armored vehicles. This swamp divided the area into two separate flanks. The western section was to be reinforced with 68 concrete bunkers while the eastern, much shorter, with 25. In peacetime the 20th Division was located in Baranowicze. In case of a war with the USSR, it was planned as the first-line unit to defend a line of German World War I fortifications built there in 1915. Because of that, most of its soldiers had experience in defending fortified positions. The construction of bunkers in the western section of the front, near the town of Mława, was started on July 14. It was carried out mostly by the soldiers themselves, under the command of the head of the 20th engineering battalion, Maj. Juliusz Levittoux. The construction of the eastern flank bunkers near the village of Rzęgnowo started on August 12. Soon the soldiers were joined by a number of civilian volunteers, helping to dig the trenches. However, the positions were not finished until the outbreak of World War II and many of the bunkers were not completed. At noon on September 1, 1939 the Polish line of defence manned by the 20th Infantry Division was attacked by the 1st Army Corps under General Walter Petzel. Although the attacking forces were equipped with tanks and supported by warplanes, the initial assault was repelled by Polish-made 37mm AT guns, the commander of German Third Army, ordered his units to attack the Polish forces several times in a row, but all attacks were broken and in the late evening the Germans were forced to withdraw to their initial positions. The following afternoon the German units started a heavy artillery bombardment of the Rzegnów position on the right flank of the Polish forces. After two hours of constant artillery fire, the assault was started and, in the result of close combat, the Polish defenders started to waver. 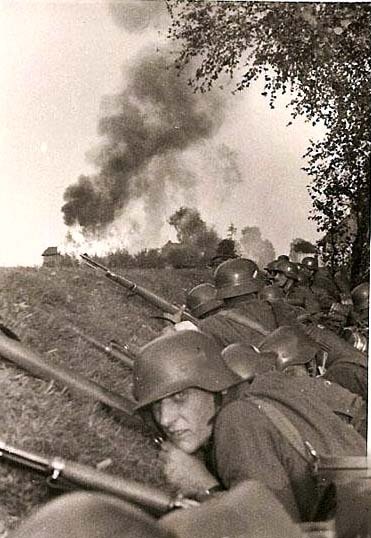 The counterattack of the Polish 79th Infantry Regiment was unsuccessful and the commander of the Polish Modlin Army ordered the 20th Division to extend further eastwards and prepare the defence of its right flank between the villages of Dębsk and Nosarzewo. At the same time the 8th Infantry Division, until then held in reserve near Ciechanów, was ordered to prepare a counterattack. The 8th Division arrived in the area in the early hours of September 3. As the Mazovian Cavalry Brigade operating further eastwards was also endangered by German armoured troops, the army commander ordered the division to split its forces and attack in two directions: towards Grudusk east of Mława and towards Przasnysz. However, conflicting orders and German diversants operating in the rear disrupted both attacks and led to chaos in the Polish ranks. In the evening the division was mostly destroyed and only the 21st Infantry Regiment of Colonel (later General) Stanisław Sosabowski managed to withdraw from the fights towards the Modlin Fortress. 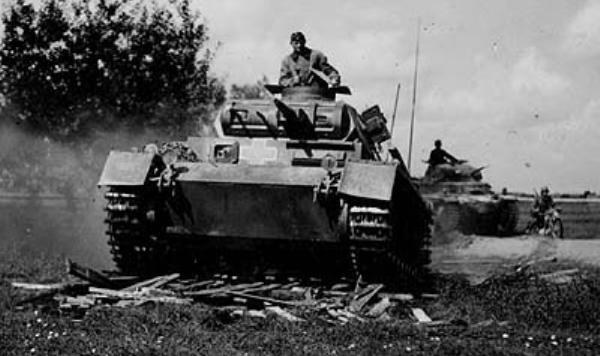 Despite this, the German attacks towards both flanks of the 20th Infantry Division were unsuccessful. 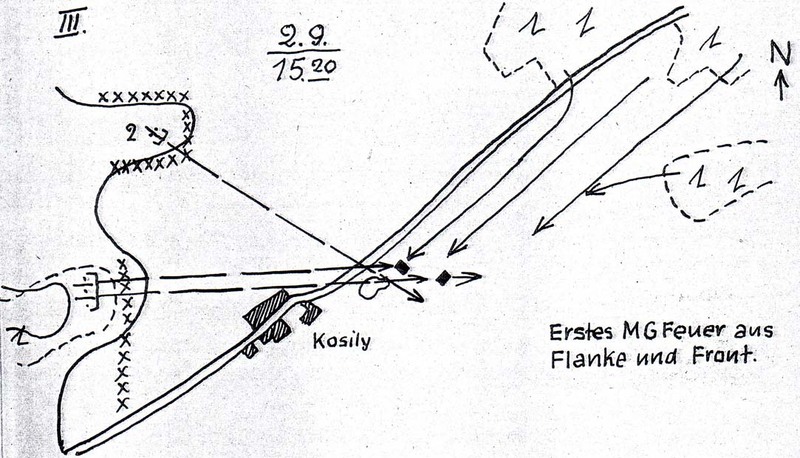 On September 3 the German engineers finally managed to cut through Polish antitank barriers. 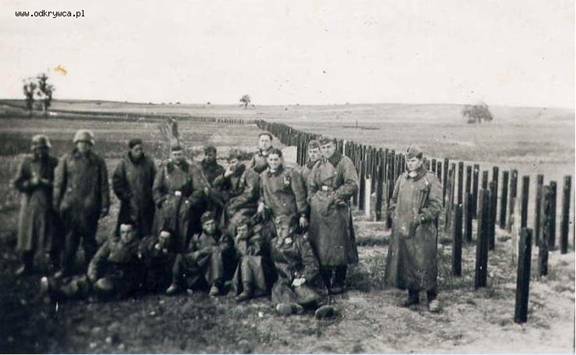 According to several Polish sources, German units used the local civilians as human shields, which allowed them to finally capture several bunkers on the left flank of the Polish forces, but were unable to push forwards. On the right flank, in the Rzegnów section of the front to the east of the swamps, the attacks were more successful and in the late evening elements of German Wodrig Corps finally broke through the lines of the 79th Infantry Regiment to the rear of the Poles. This widened the front gap in the area ofGrudusk. 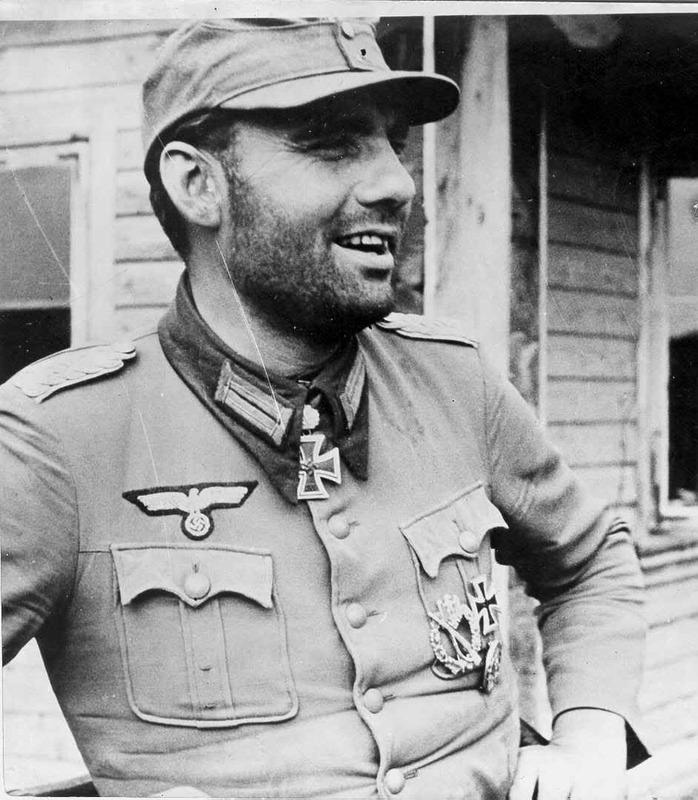 General Emil Krukowicz-Przedrzymirski, facing the risk of his forces being outflanked and surrounded, ordered the 20th division and the remnants of the 8th to withdraw towards Warsaw and Modlin, finally abandoning the fortified positions. But lets rewind the clock to the 2nd of September 1939, and have a look at the role of 1.ID in the Battle of Mlawa and more precisely at the north-eastern corner of the fortress of Mlawa, to the Gora-Kamienska (Kamienska hill) and the efforts of the Division to take it. The bastion of Gora-Kamienska lay half way between Krzynowloga-Mala and Grudusk towering over the surrounding terrain with a height difference of around 60 meters. 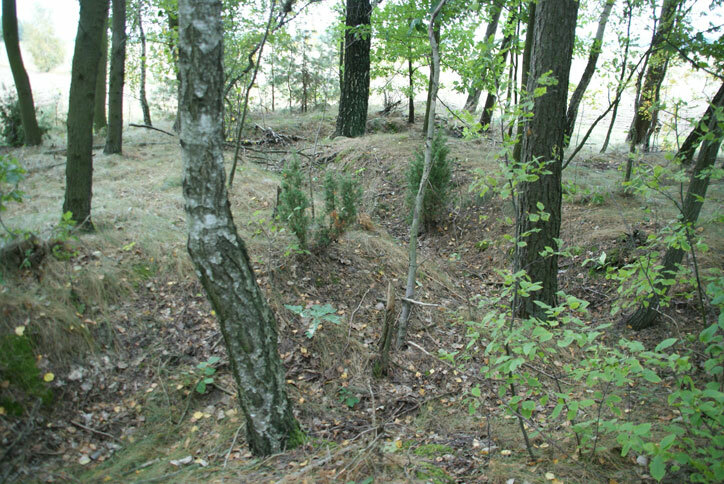 The bastion and the adjoining fortifications in the forest south of Szumsk had been developed to a strong cornerstone of the Mlawa defensive positions. It had been vested with trenches, double-apron entanglements, timber shelters and six concrete bunkers allowing for enfilading fire. Its forefront was further defended by advanced pickets and multiple minefields. The positions were defended by the the 79th Polish infantry regiment (commanded by ppłk. Konstanty Zaborowski) and supported by about seven batteries of artillery. 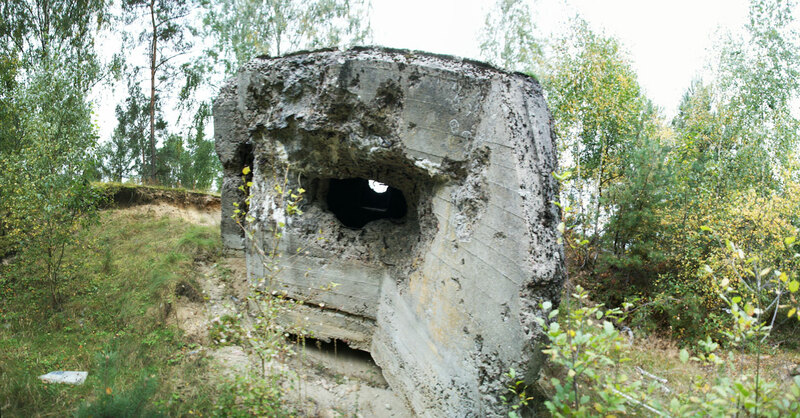 Remains of the bunker on the northern slope of the Gora Kamiensk. The Division attacked in a pincer movement. The reinforced Infanterie-Regiment 1 attacked from the north via Dzierzgowo-Szumsk. The remainder on both sides of the road Krzynowologa-Rzegnowo. During the attack IR1 fulfilled the role of tying up enemy forces in forest south of Szumsk. At 1500h the main force began its advance, having to cross about 2 kilometers of open ground. The advance was covered by concentrated artillery fire on the Kamienska positions. In order to make the artillery fire more efficient an observation balloon was launched , which was flying in the neighbourhood of Rzegnowo and directing artillery fire of 1 ID. In the church tower in Dzierzgowo 1ID located their second observation post but this was soon detected by Polish forces and destroyed by one troop of 20 pal (20 light artillery battalion). 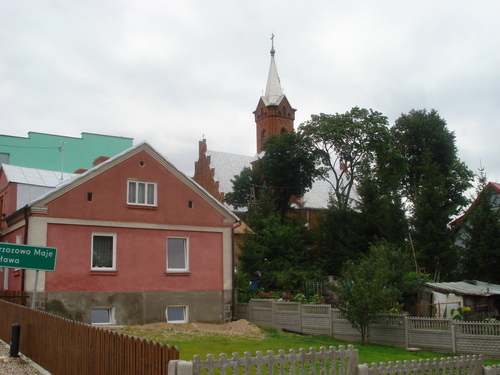 Dziergowo church. 73 years ago used by 1IDs artillery observers. 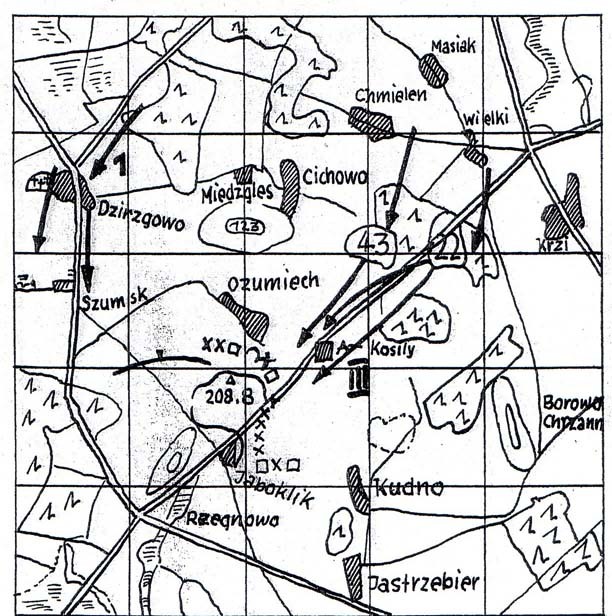 III./IR43 attacked north of the road (Krzynowologa-Rzegnowo), followed by I./IR43 as a reserve. III./IR22 moved forward south of it, having II./IR22 as regimental and I./IR22 as divisional reserves. Heavy German artillery fire allowed for a fast advance. 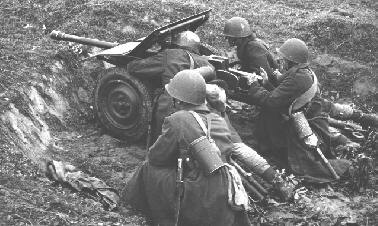 Having reached the villages of Ozumieck and R. Kosily the battalions came under frontal and flanking machine gun fire, effectively stalling the advance of III./IR43. “At half past three in the morning I was woken by Leutnant Götz, once member of my company, now second adjudant to the CO of I. Batallion. “Herr Hauptmann, you are ordered back to the regiment to take over command of I. Batallion”. Even the classic Goethe quote* (see below) would not help me, so I got up and stumbled up to the regimental command post, joining I. Batallion shortly afterwards. We had been ordered to act as divisional reserve! I was swearing my head off, but to no avail. Notwithstanding that I also got hit by a fit of diarrhoea. Our Doctor called it a gastric flu, but I call it the worst kind of diarrhoea I have ever experienced! I also had a temperature. I guzzled down a dose of opium, quinine and tanalbin every 15 minutes, but dragged through the whole thing as well as I could. Not that we had much to do. Changing positions into a different wood every 2 or 3 hours, three kilometers away from the frontline. The boring fate of the reserves. * “Tell your captain that for His Imperial Majesty, I have, as always, due respect. But he, tell him that, he can lick me in the arse!” – Johann Wolfgang von Goethe, “Götz von Berlichingen”. III./IR22 managed to break into the enemy trenches south of the road and to push forward to Zaboklik. Following that, IR22 (including all its reserves) received the order to swing into the attack on the Gora Kamienska. 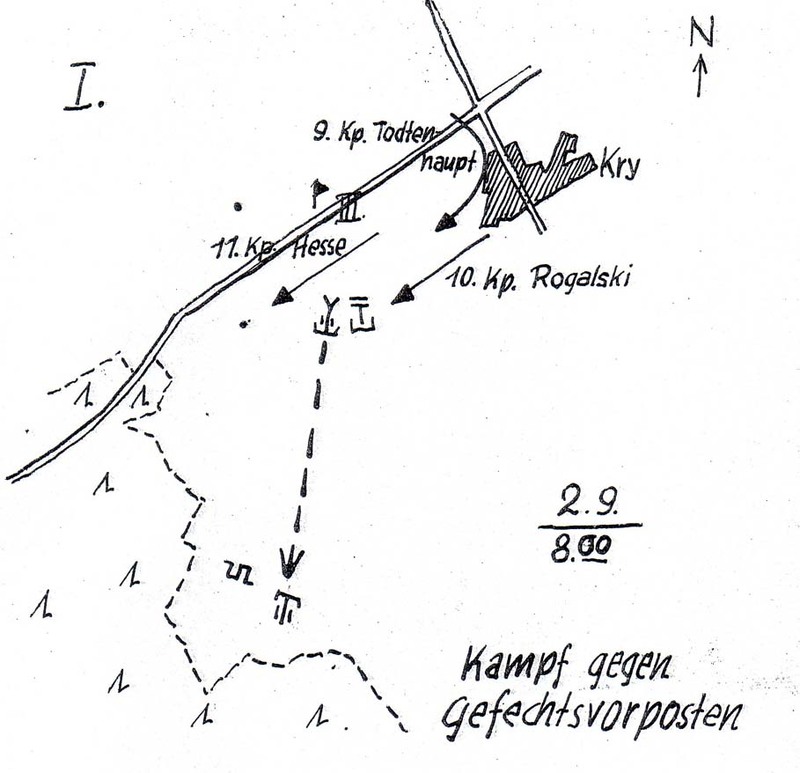 II./IR22 (commanded by Major Knobelspieß) advanced in a fast pace, crossed the road between R. Kosily and Zaboklik and broke into the system of trenches north of the road. Forests, trenches and dugouts were cleared and two concrete bunkers on the north side of the hill were taken. Polish resistance was fierce, many of the Polish soldiers refusing to surrender. The Poles kept on firing on the German attackers until the last possible moment, but always retreating as so to escape close combat and being taken prisoner. By 1800h II./IR22 had taken the peak of Kamienska hill. When darkness set in the whole hill was in possession of III./IR43 and II., III./IR22. The fall of the Gora Kamienska had sealed the fate of the fortress of Mlawa, which I.AK had failed to take the day before. 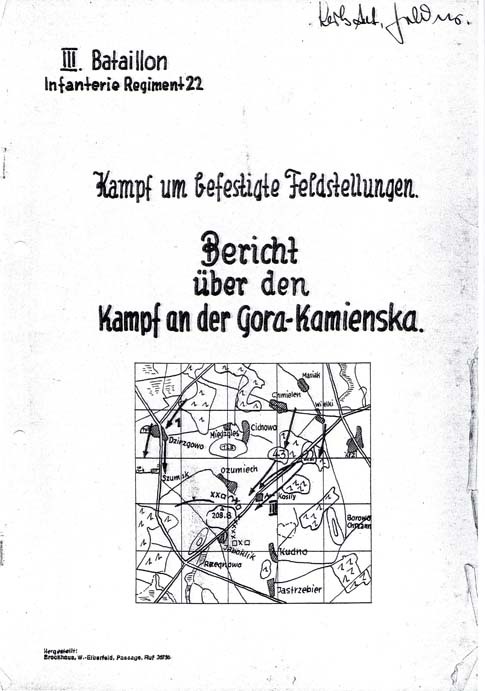 The most detailed description of the fighting for the Kamiensa ridge can be found in a report published in Germany by the end of 1939 for III./IR22. This batallion had borne the brunt of the fighting and the report evaluated strengths and weaknesses, tactical dispositions and summarised the lessons learned from it. The reinforced III./IR22 began its attack on 0800h having its right flank close to the road Krzynowloga-Mala/Grudusk. When it reached the hamlets about 1000 meters southwest of Krzynowloga-Mala it recieved enemy fire from the area of Hill 195. This hill lies about 2000 meters southwest of Krzynowloga-Mala and was occupied by enemy pickets. The batallion kept on advancing in a fast pace and pushed the enemy out of his defensive positions. The Poles had retreated in a hurry, leaving large quantities of ammunition, clothing and equipment. It was the first time III. Batallion had been in battle and the first time the new machine guns (MG34) and mortars (Granatwerfer 34) had been used in action. “The men were pleased about their own firepower, which was far superior to that of the enemy, even from an acoustic point of view. Any doubts we had on the MG34 were wiped out. The enemy retreated from the weight of our fire and the pressure of our attack. The will to fight and the effectiveness in combat showed that our hard training before the war had finally paid out”. The batallion now pushed through the forest with the order to take defensive postions on its southwestern corner. This was done without encountering enemy resistance. When the edge of the forest had been reached, the men of III. Batallion could see Polish forces retreating across the the road to Grudusk. The order to follow the retreating enemy was cancelled by a regimental command. For now III. Batallion stayed in position. The batallion was just digging in, to take cover from sporadic Polish artillery fire when it finally recieved the regimental order to attack the Gora-Kamiensk. The whole Division would take part in the attack, supported by all available artillery which was now concentrating its fire onto the enemy positions. The first target for III./IR22 was the village of Zaboklik, the second target the road Rzognowo-Borkowo. 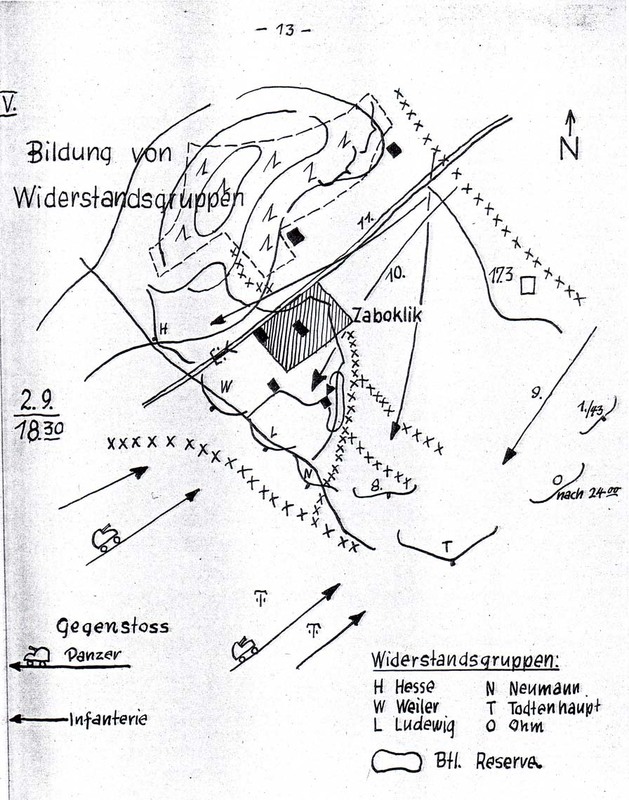 11th coy, supported by a parts of the mortar company, was to attack from its positions in the forest north of hill 169, in the direction of Kosily-Zaboklik. 10th coy, supported by two mortar squads and a platoon of heavy machine guns, was to support this attack. 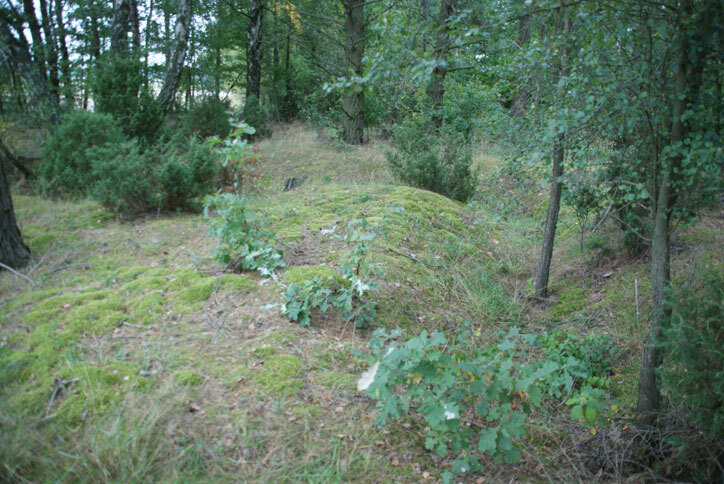 An assault platoon of 9th coy was to attack the bunker on hill 173, the remains of 9th coy were to support 10th coy under the command of Hauptmann Todtenhaupt. Another target for 11th coy was the village of Rzegnowo, while 10th coy was to attack the ground northeast of it. Two light infantry gun platoons were to cover the advance of the companies. “The Gora is now covered in smoke and flame and the air is filled with the roar and thunder of constant artillery fire. The commander has a look at his watch. Five minutes to go, four, three, two, now its only one minute. Then the shout “1oth company attack!”. Under cover of the attached mortar sections and heavy machine guns,10th and 11th coy managed to push forward into the dead angle of Kosily village, now temporarily secure from flanking and frontal enemy fire. Still when entering the village casualities begin to rise, when some soldiers fall victim to Polish anti infantry mines. For the next step, the companies of III./IR22 had to continue the advance over a plain field, under constant frontal and flanking fire from the Polish bunkers which the artillery was not able to suppress. As the neighbouring divisions were not able to send units to support the attack, the commander of III. Batallion decided to push forward under cover of the weapons available to him. 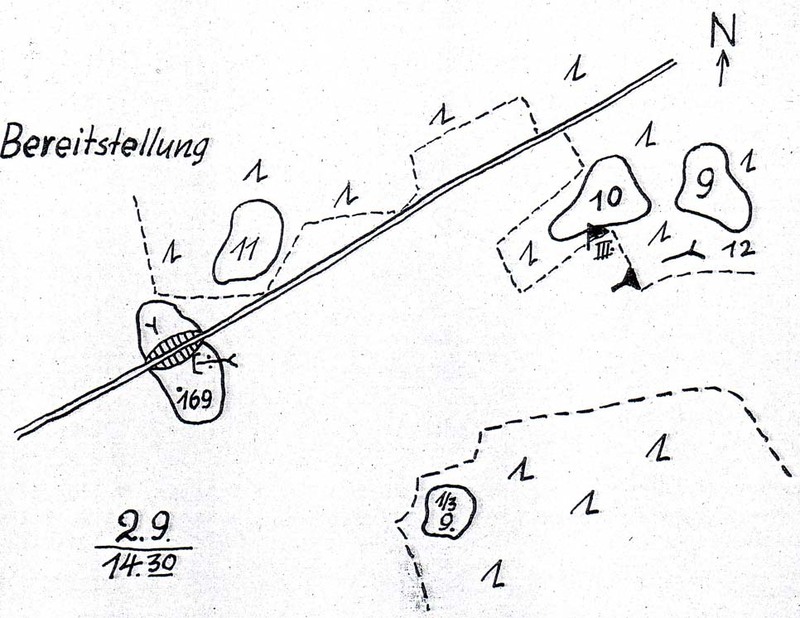 By committing two 37mm AT guns of 14th coy (Oberleutnant Tolsdorff) which targeted the enemy bunkers and positions with direct fire and the reminder of the heavy company (12th coy) under Feldwebel Marquardt and Unterfeldwebel Langer the assault on the Gora Kamienska began to gain momentum. Casualities began to rise. Hauptmann Marquardt (commanding 10th coy) got wounded, squadleader Feldwebel Kanapin, and Gefreiter Mornigkeit got killed. Another 11 men of 10th coy got wounded. 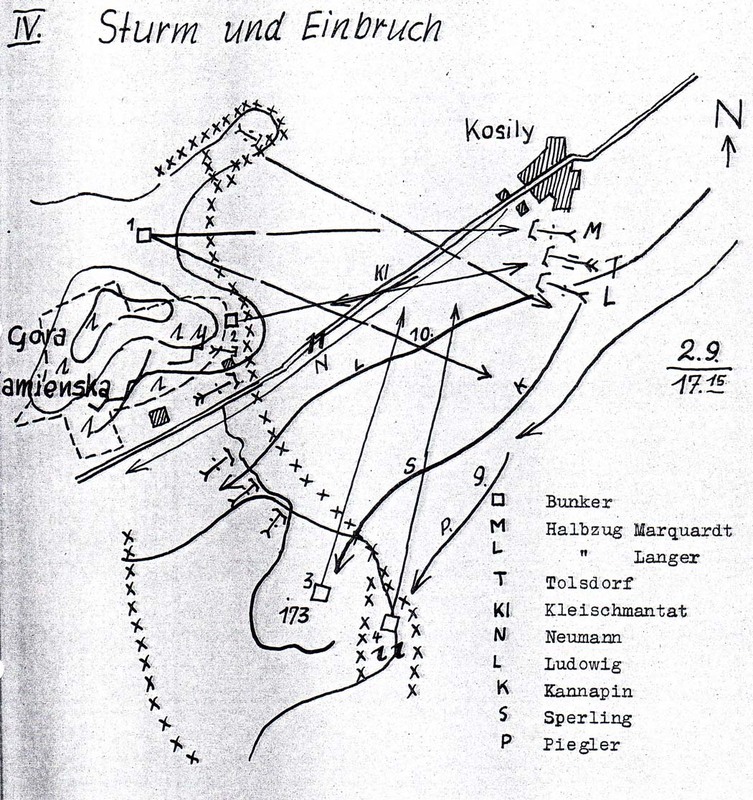 11th coy lost the Füsiliere Braun, Kuklen and Oschkenlat who were killed and another 7 soldiers wounded. Still the attack did not stall. Some motivation came from the fact that by the late evening, signal flares and the sounds of machine gun fire could be observed on the batallions right. 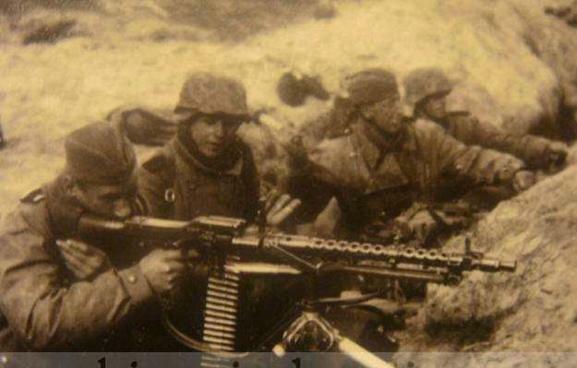 Its neighbour, Infanterie-Regiment 43 had joined the attack on the Goras other side. 11th coy managed to clear the roadblocks on the southern slope of the Kamienska and captured a Polish anti-tank gun which they now used against its former owners. An assault platoon commanded by Feldwebel Kleinschmantat worked its way towards the bunker on the right side of the road (2). 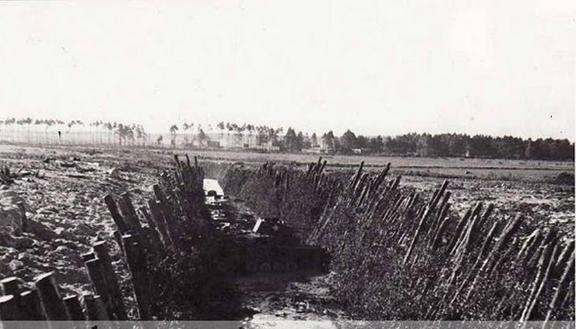 10th coy had crossed a wire entanglement and broke into the enemy trenches behind that. The assault squad of 9th coy had been pinned down by enemy flanking fire. 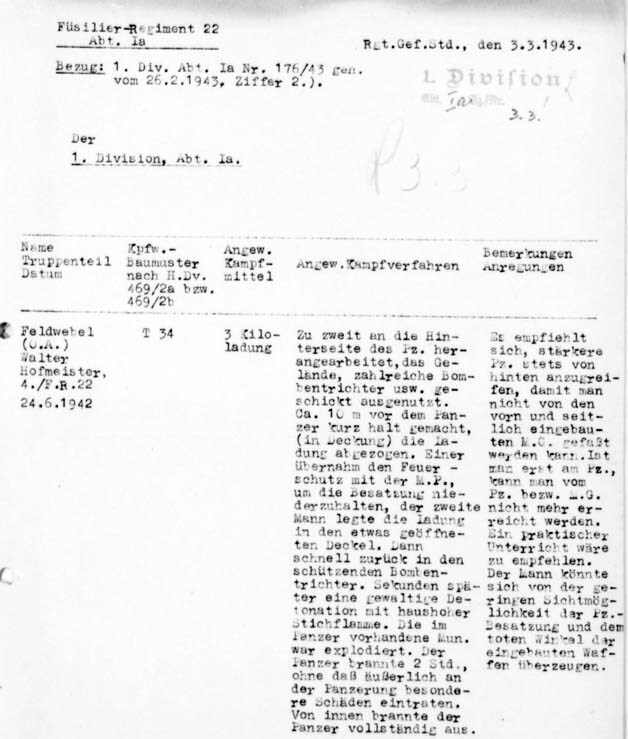 When the commander of 9th coy, Hauptmann Todtenhaupt, noticed that he personally took the lead. Lying down and crawling, he led the squad through enemy fire until it had reached a potato field about 300 meters in front of Bunker 4. From here the soldiers had enough cover to move forward one by one. 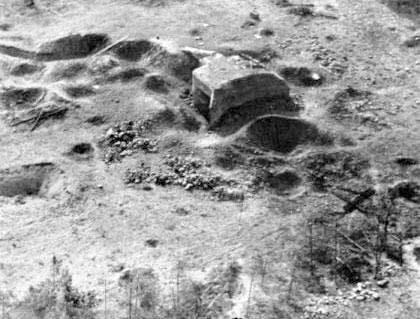 Bunker 4 was attacked from the left side. Light mortars and machine guns provided enough suppression for the soldiers of 9th coy to get into range to use handgrenades. When it was finally taken no enemies could be found, the Poles had retreated in the last possible moment, leaving behind ammunition crates and equipment. One of these battlegroups led by Leutnant Neumann managed to push forward to the village of Rzegnowo. On the hills northwest of it the Poles seemed to have held some units in reserve. 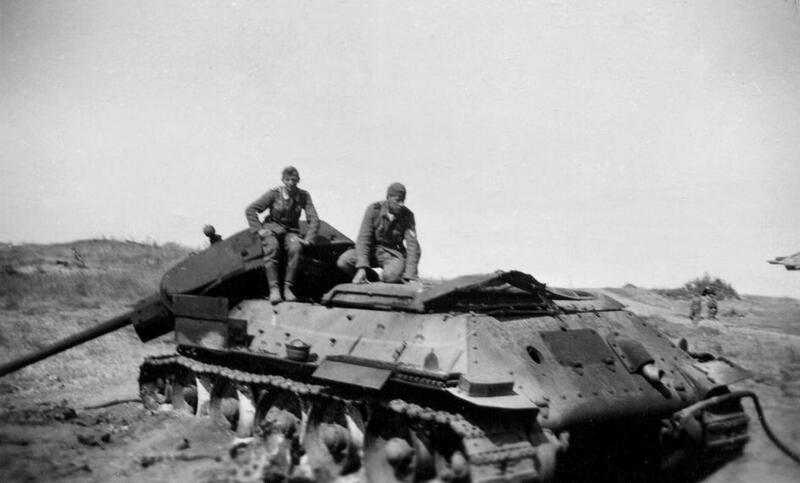 From this position they now started a strong counter attack supported by light tanks which forced Neumanns battlegroup back to western side of Zaboklik. 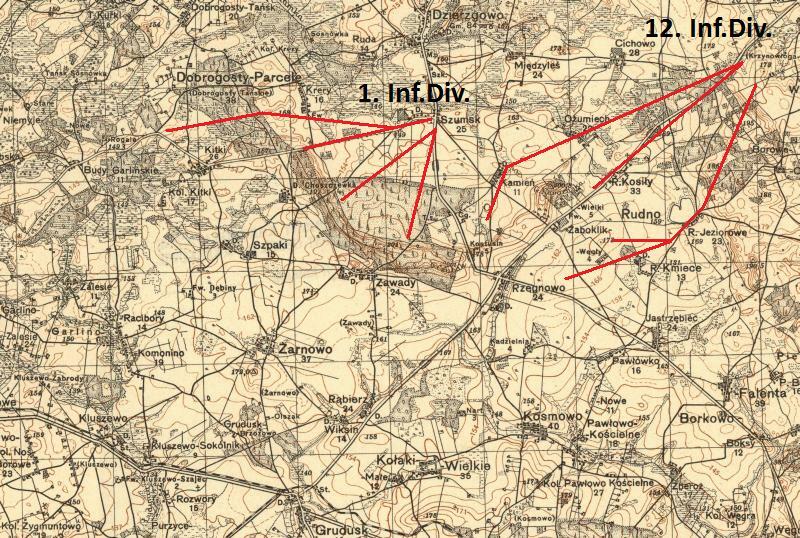 In the meantime, at about 1830h, 10th and 11th coy, together with parts of 9th coy had also reached Zaboklik. Everywhere in the village machine guns and mortars were brought into position. Supplies were alarmingly low and single soldiers were sent back to collect ammunition from the dead and wounded. Without artillery support and low on ammo the commander of III./IR22 decided to hold Zaboklik and to organise a defence. 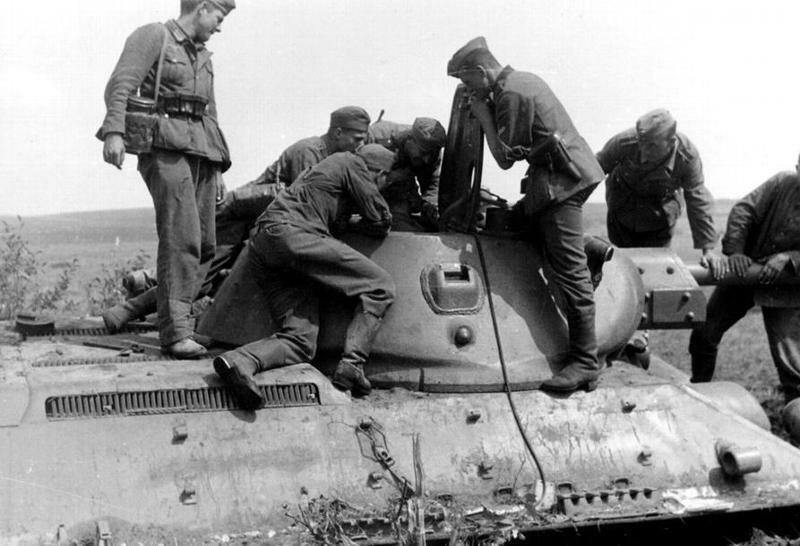 Parts of II./IR22 had in the meantime arrived in Zaboklik aswell, and with these, six defensive groups were formed. The counter attack was carried out by the 2nd batallion of the 79th polish infantry regiment, supported by elements of its 3rd batallion and a company of TK Tankettes commanded by Lieutenant Mieczyslaw Kosiewicz. The situation for the German defenders was critical. In the previous combats the straw on the fields behind the batallion had started to burn. Smoke and fire was everywhere. This made is difficult to bring in ammunition and to bring out the wounded. 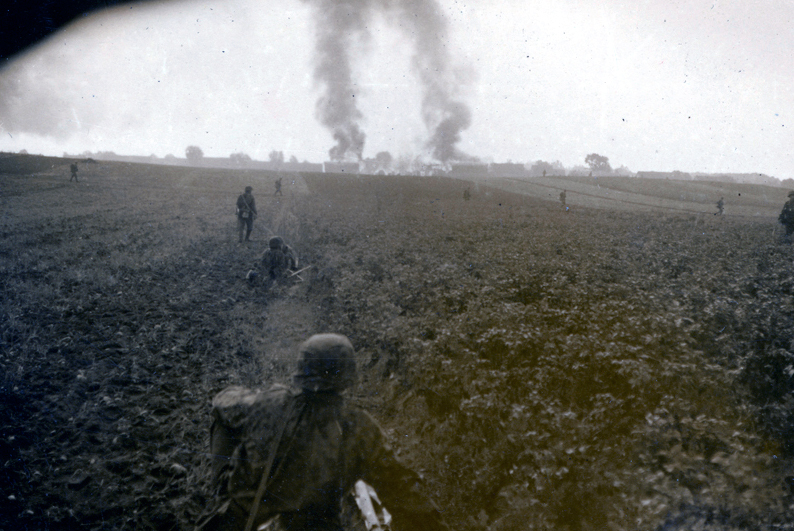 The soldiers of the Polish 79th Regiment were fighting most couragously, coming extremly close to the German positions. The left flank of Zaboklik was unguarded and IR22 always in the danger of getting outflanked. The fighting lasted through most of the night. On midnight a company of IR43 arrived, finally guarding Zabokliks left flank. In the early morning, the Poles retreated. 1. 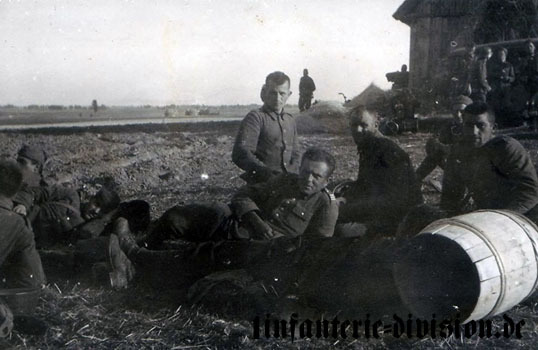 Infanterie-Division (IR43/IR22) had taken the Gora-Kamienska and repulsed a counter attack at Zaboklik. The brunt of the fighting had been taken by III./IR22 which, after the fighting, had 12 soldiers killed in action and 20 severely wounded. Not much, considering that it had assaulted a fortified position and defended against a counter-attack by two Polish batallions and one company of tankettes. The north eastern flank of the fortess of Mlawa had been crushed. 1. Infanterie-Division had gone through its baptism of fire and was able to try out new weapons and tactics. 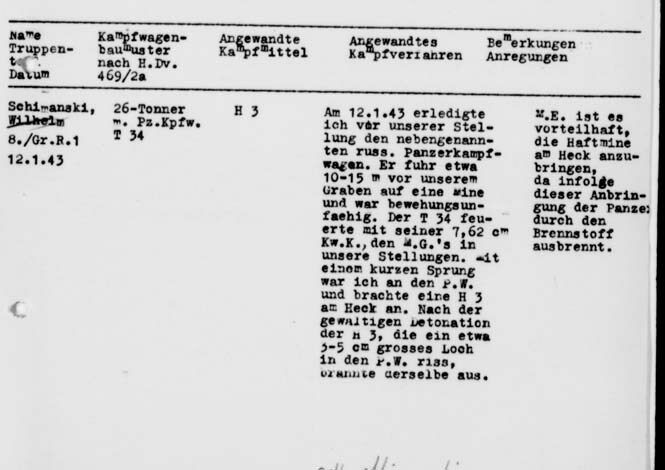 According to the combat report of III./IR22 the new MG34s had been a complete success, as had the new ammo type “SmK(H)”. These 7.92mm rounds had a tungsten alloy core instead of an iron one. This gave the round an excellent armor piercing capability (13 mm for 30° impact angle). Every riflemen was issued with 10 rounds of this expensive ammo. 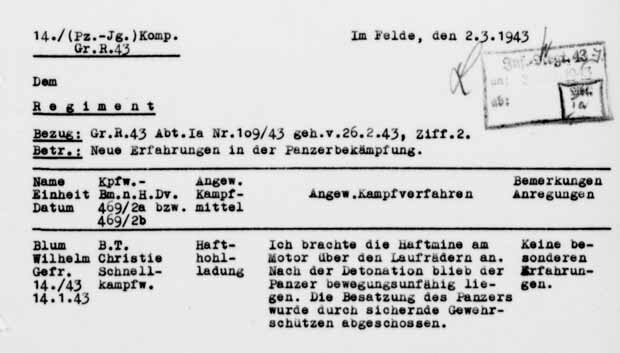 The report states that enemy tankettes turned and retreated after being fired at with SmK(H). It also notes that the ammo consumption of the MG34 was far worse than expected. The machine gun companies running out of ammo after only two hours of battle, having exhausted half of the batallions reserves! It advises to fire in shorter bursts, as many Polish dead had 6 or more bullet wounds. 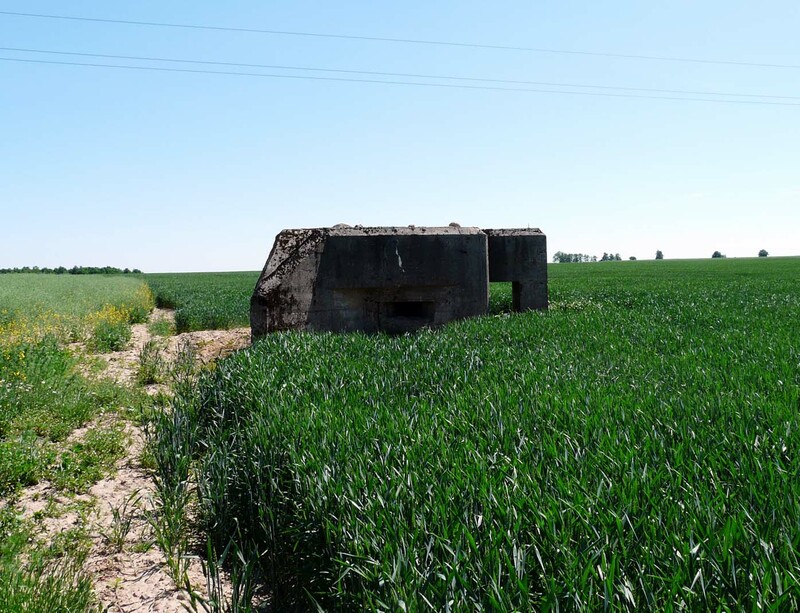 It was noticed that it was impossible to suppress concrete bunkers sufficiently by the use of artillery only and that without the use of 14th coys AT guns (firing directly) the attack would have stalled. 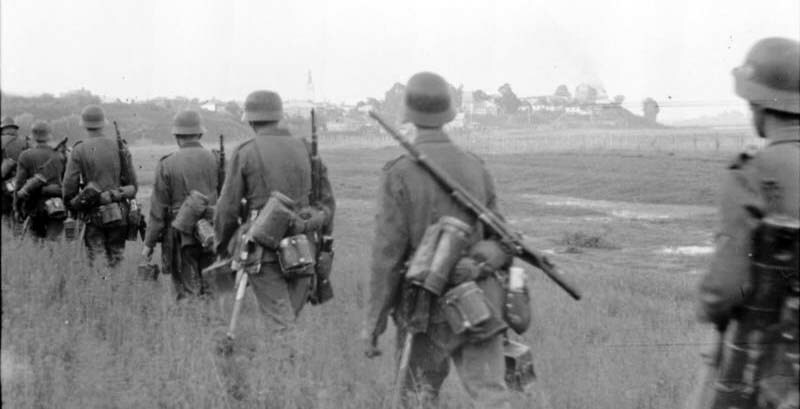 The battle of Mlawa had cost the Wehrmacht 1800 soldiers killed and another 3000 wounded. Polish losses being about 1200 killed and another 1500 wounded. Although the Mlawa position was finally abandoned on the 4th of September, the German forces suffered substantial losses and it was not until September 13, when they finally managed to reach the Modlin Fortress, located less than 100 kilometres to the south. For the 1. 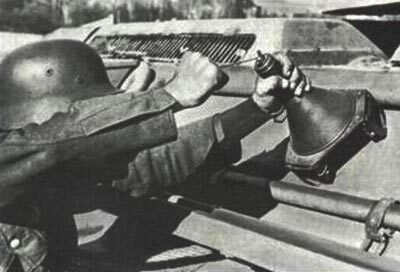 Infanterie-Division Gora-Kamiensk had been a baptism of fire. Six years of total war still lay in front of them. For the period of January and February 1943 the divisional war diaries (NARA T315 R8/R9) of 1. 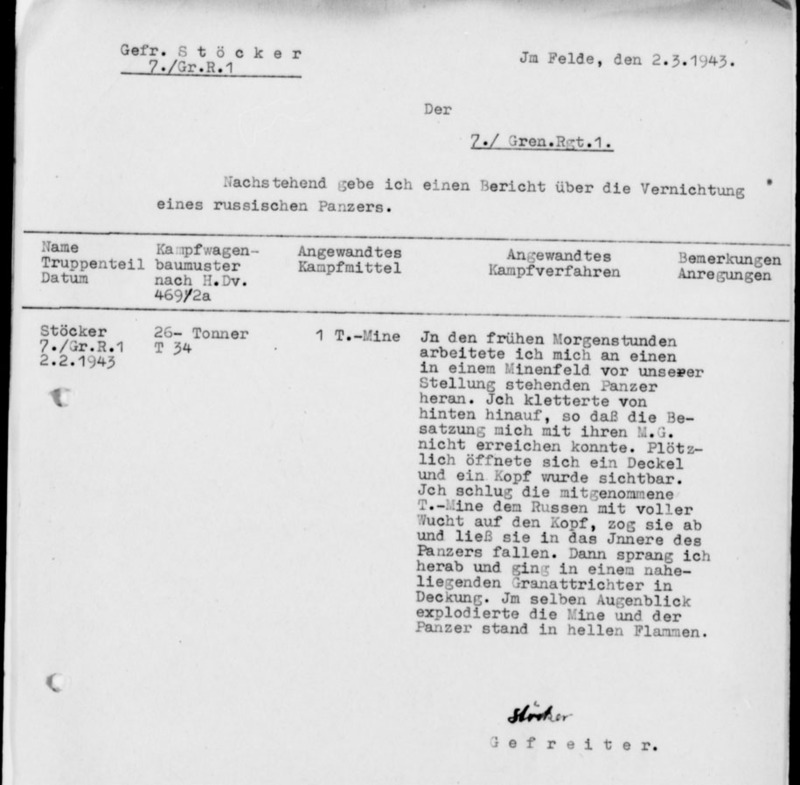 Infanterie-Division hold a series of highly interesting documents which relate to the experiences of soldiers who destroyed an enemy tank single-handedly by use of a hand-held weapon. The infantry divisions of “HG Nord” (Army group north) in 1942/43 had a chronic shortage of larger caliber AT and Flak guns with which to combat enemy tanks effectively. This resulted in gaps in the defences, which made an inviting target for enemy armour. As always when somebody had to take the rap, that somebody was the infantry. The first report is by an NCO who I “know” quite well. 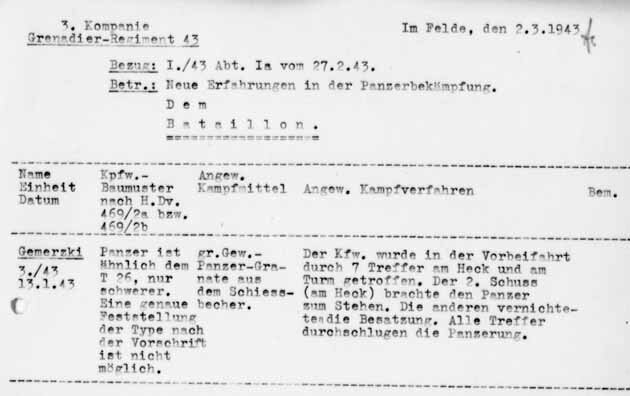 Feldwebel Hofmeister was my grandfathers “Zugführer” (platoon leader). 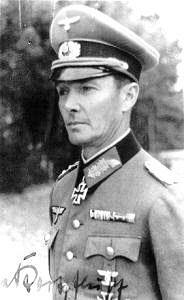 He was killed holding the rank of Hauptmann (Captain) in 1944. On my website you can have a look at his military documents and his photo album. 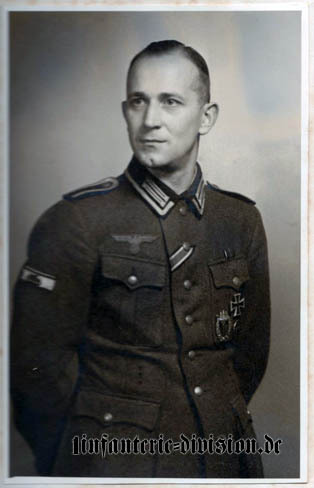 Unteroffizier Hofmeister, 4./FR22, wearing the tank destruction badge on his right sleeve. 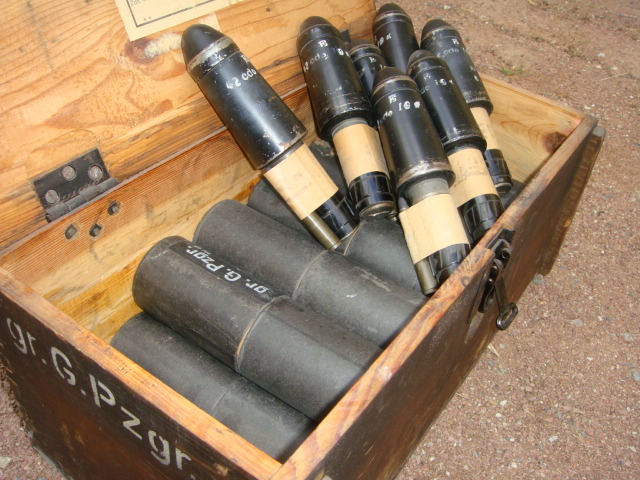 German handgrenades. Geballte Ladung (concentrated charge) lying in front. Männer gegen Panzer (Men Against Tanks) is a 1943 German film, produced by Lehrfilm, which was used as a training film by the Wehrmacht. 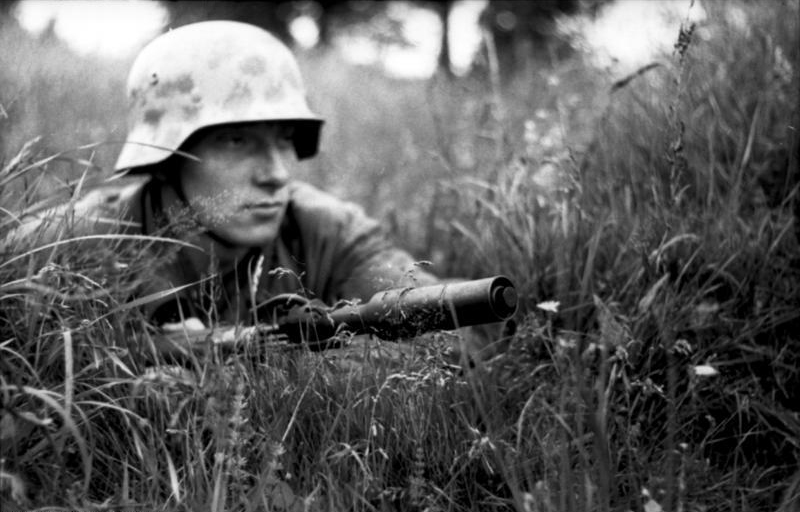 Its purpose was to show the German soldiers the different types of infantry anti-tank warfare. The duration of the film is 28 minutes. The film consists of three parts. The first part shows a staged combined Soviet tank and infantry attack against entrenched German infantry. 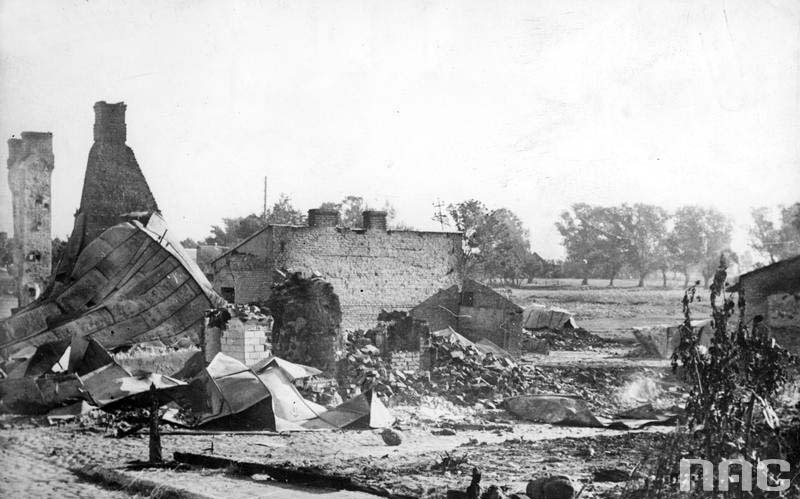 The attack is preceded by artillery and air strikes. 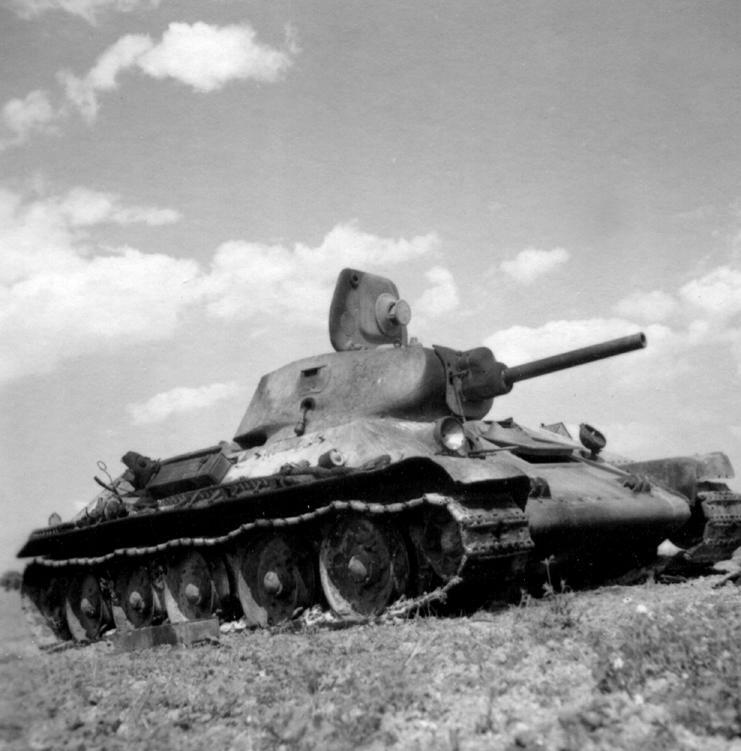 The tanks, several T-34 model 1941/1942/1943 and a KV-1, are dealt with and destroyed by different means of improvised and dedicated anti-tank weaponry. 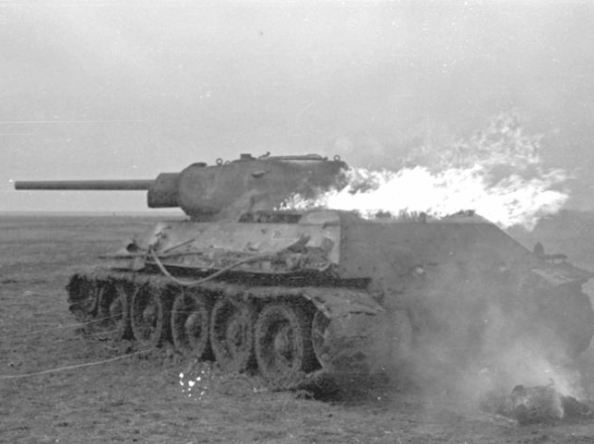 Right and wrong approaches to destroy a tank single-handedly are displayed. At the end of the attack,Wilhelm Niggemeyer, a holder of the Knight’s Cross of the Iron Cross with Oak Leaves and four tank destruction badges, is shown in action, destroying the KV-1 with a mine. The second part shows how rear-service troops must be prepared for anti-tank warfare, as they too can encounter enemy tanks. 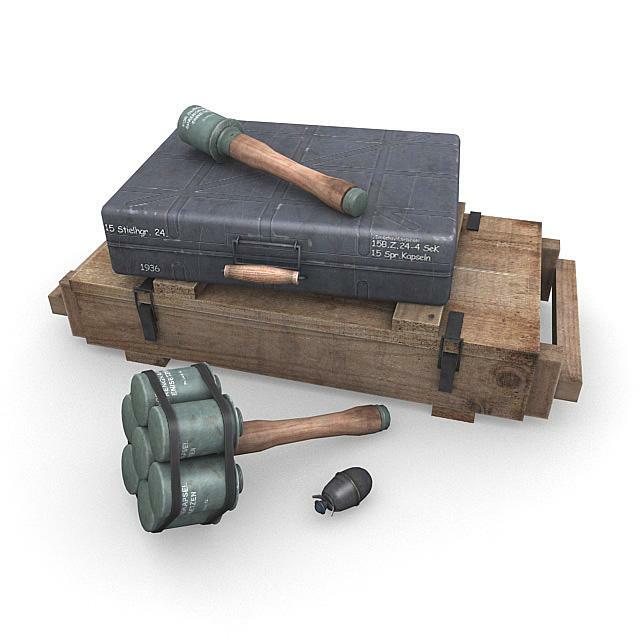 The third part presents the Grosse Gewehrpanzergranate, Kampfpistole42LP, Püppchen, Panzerfaust, Panzerschreck, their use and their effect against tanks. The Soviet equipment used in the film, including uniforms and weapons, are authentic captured Soviet stock. The Soviet officer’s uniforms were made before the 1943 reforms of the uniform. The only exception are the aircraft used, the AT-6, which were captured in the Battle of France. 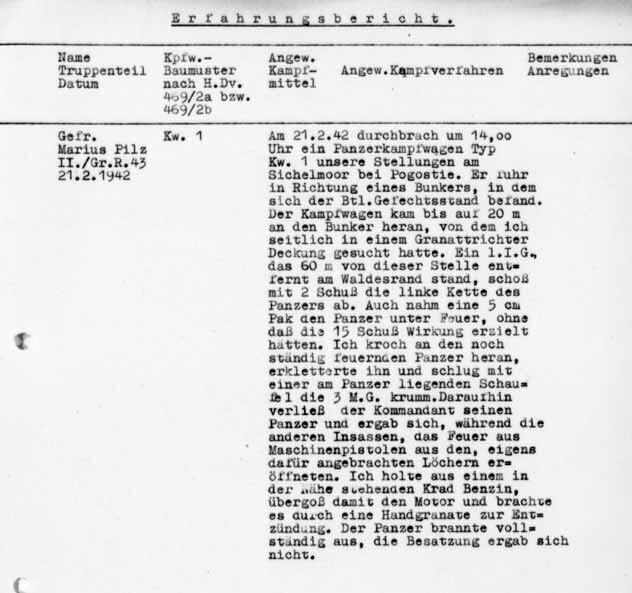 Part two starts with a report written by a soldier of GR43. Its final sentence is hair raising. “On the 21st of January 1942 a tank of the KW-1 type broke into our positions at the “Sicklemoor” near Pogostje. It drove into the direction of a bunker which held our batallions command post. When it was about 20 meters away it took two hits from a light infantry gun which was itself positioned about 6o meters away from the tank. The shots immobilised the tank and blew off its left track. 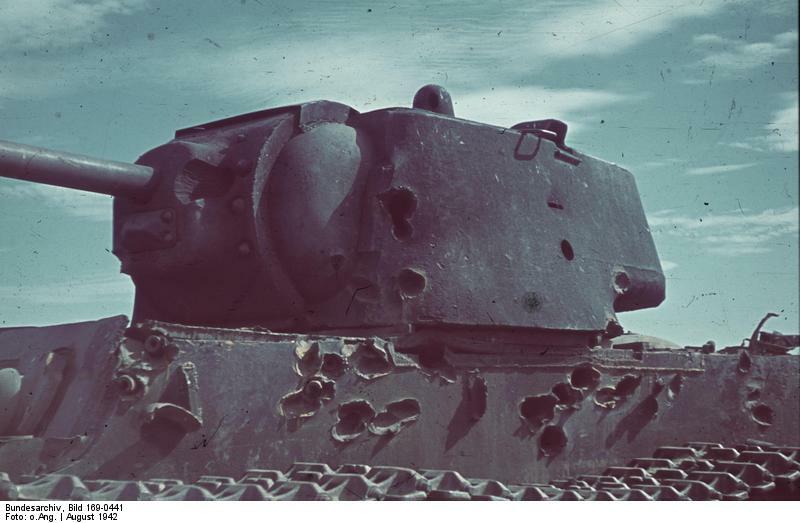 One of our 5cm AT guns now opened fire on the tank, but 15 shots stayed without effect. I crawled up to the KW1, climbed it and bent the tanks three machine guns by beating them with a shovel which I had found on the ground. 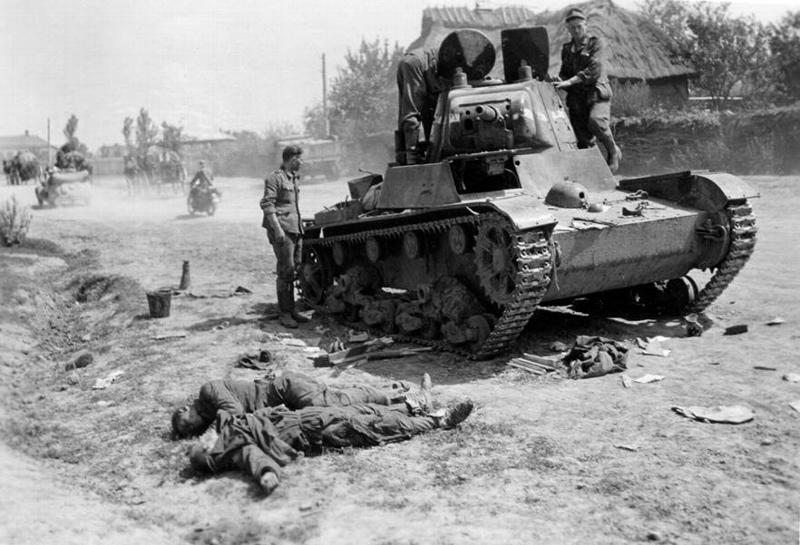 Thereupon the tank commander climbed out and surrendered. The remaining crew now opened fire with submachine guns through small holes, especialy made for this purpose. 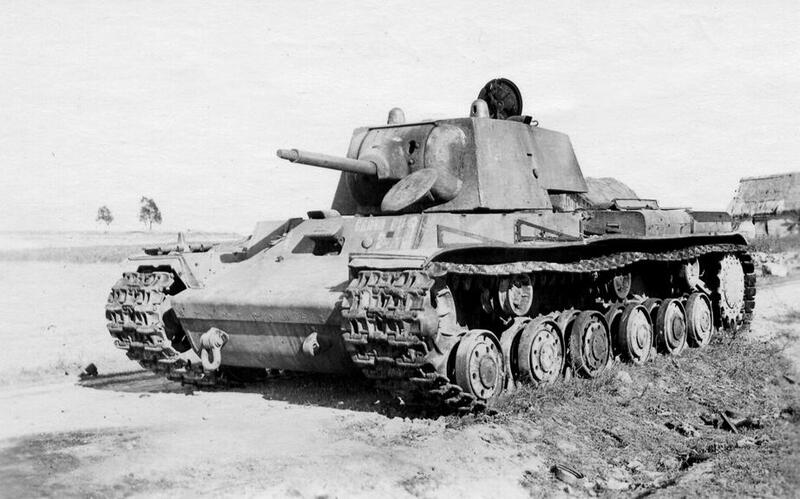 Destroyed T-26 light tank. Its crew lies dead on the roadside. Grosse Gewehrpanzergranate. Large AT rifle grenades. Men against tanks, Part III. “In the early morning hours I worked my way towards a tank that was standing inside a minefield in front of our positions. I climbed it from behind, so the crew could not hit me with machine guns. Suddenly a Coppola was opened and a head became visible. I took the AT mine I carried and, as hard as I could, smashed it on the russians head. Below you will find some german wartime manuals and pamphelts on anti-tank fighting and the usage of the panzerfaust. 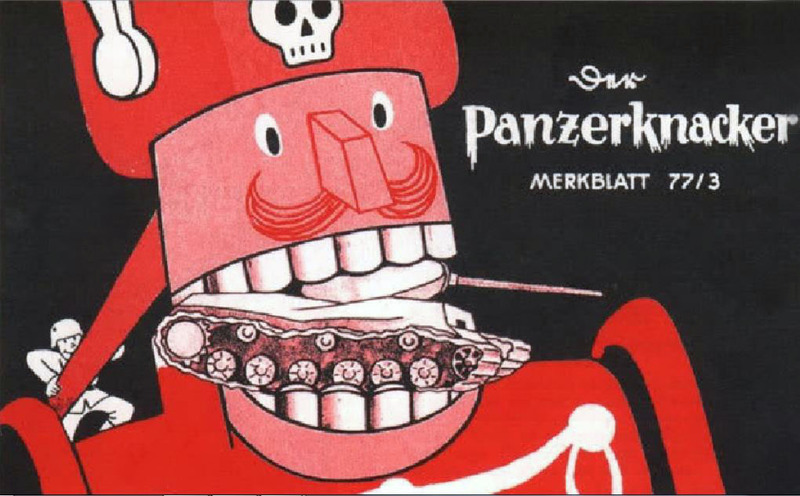 The most famous being “Der Panzerknacker” (The tank cracker), a humorous manual on the subject, issued to some troops in 1944/45.